The Copper Canyon region was once a popular adventure tourism site; but with the advent of the drug cartel war, tourism has virtually vanished. Unfortunately, this area is now called the “Golden Triangle” of Mexico due to extensive opium cultivation. Mexico is now the main supplier of heroin to the United States and the drug cartels that control the region frequently engage in violent conflicts in order to maintain control of the drug smuggling routes. It is our hope and prayer that peace will return to the region since it has the potential to be one of the most popular adventure tourism areas in the world. But, at present, we do not recommend that persons engage in tourism in the Sierra Tarahumara. Persons traveling to work at Hospital Misión Tarahumara will be provided with specific instructions as to travel routes that we have found to be relatively safe. GreatAdventures.com A secular travel site with an excellent overview of Copper Canyon. Remarkable Journeys This site sells tours, and has a complete page of information. 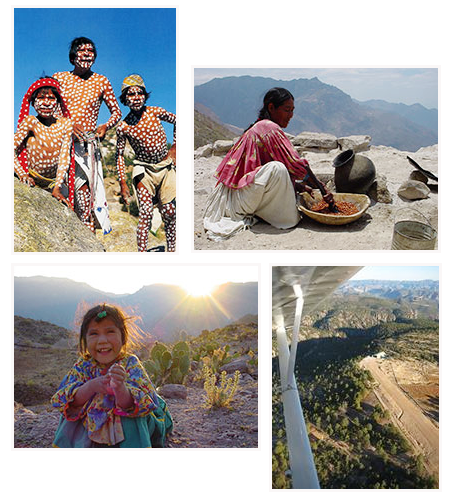 MexicoOnline Brief info page about Tarahumara. Mexico's Sierra Tarahumara, a Photohistory, by W. Dirk Raat. Tarahumara history. Tarahumara: Where Night is the Day of the Moon, by Bernard Fontana. Photos of Tarahumara life. Mexico's Copper Canyon, by Richard D. Fisher. Informational guide with photographs. Guide to Mexico's Copper Canyon, by Richard Gordon. Facts and a smattering of Spanish. Northern Mexico Handbook, by Joe Cummings. A good "big-picture" guide to the Sierra region.